The second Italian edition of the European Maker Faire, held in Rome from 3rd to 5th October, is just ended and has became a very big hit. Here are a few numbers: 90,000 visitors (3 times more than last year! ), 600 exhibitors from all over Europe, 15,000 kids that visited the exhibitions and took part in more than 120 dedicated workshops. The foolish and inspiring Faire has been the final performance of a whole week dedicated to innovation, startup, open source and open hardware, internet of things, crypto-coins, smart cities, sustainable and sharing economy. Many government representatives came to visit the event, like Rome’s Major Ignazio Marino and other politicians and managers from local and central public administrations; all of them took deep inspiration from the “fresh air” carried by all those innovators present there, thanking so much the smooth organization (by Asset Camera, a special company from Chamber of Commerce of Rome) led by Riccardo Luna and Massimo Banzi. …and the hearty One Love Machine Band directed by German artist Kolja Kugler and Sir Elton Junk. As a general impression, this year we have seen less “innovation” and more “applications”. This is only my opinion, but while last year in the first Maker Faire Rome edition everything was a surprise, a new consciousness that a creative spirit was crawling among people and was helping them to “make” their dream and passions and to build new job opportunities, this year we have found a more mature mood. Innovation, always present everywhere of course, has been applied to real needs and real products. Just few examples to clarify my point of view: the 3D Printing was everywhere but makers didn’t speak about “printing and printers” (with one exception, we will talk about later on) but mainly about “we want to do this, and we used also some 3d-printed parts”. Again, Drones were widely present but as tools to make surveys, to film, to assist people, not only as a flying game. Arduino, Raspberry, Galileo boards were in any single booth but in the same way as you are used to paper and pencils: the focus was on the drawing, not on the canvas! Anyway, general trends were about Wearable computing and sensors, Textile sensors, Drones, Smart Living and Domotics (focused on IoT), Environmental Monitoring (aka Smart Citizenship), Smart vegetable gardens and Hydroponic, Virtual and Augmented Reality, eHealth, re-hab and Prosthetics, Safety and Security and of course robotics and 3D Printing. As we said before, the 3D Printing presented also a new frontier: the food printing, where the pioneers were Choco-3Drag Printer (our baby!) 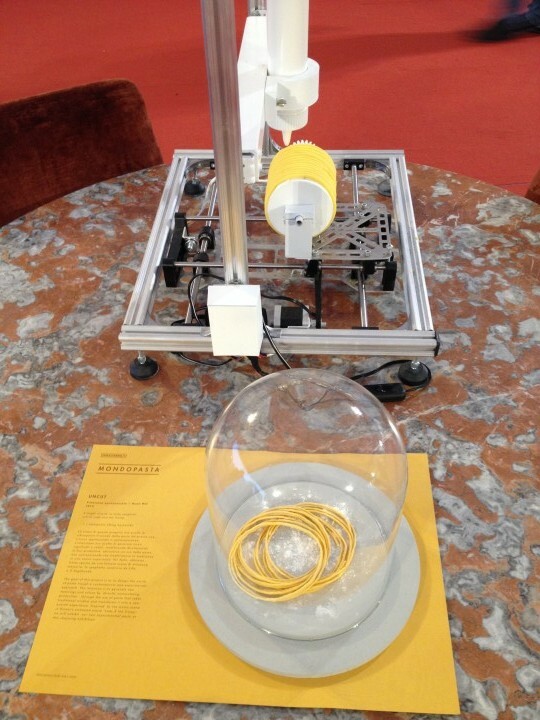 that received a special prize too, and also the Nonnabot from MondoPasta, capable of printing Spaghetti and Ravioli. Beam me up Scotty, the Star Trek’s Replicator is one step closer! The big names behind the Faire were Intel (its space as main sponsor was awesome: robotics, mini-mars rovers, virtual reality and multi-sensor interface, Galileo and Edison boards), Eni, Atmel (really crowded booth with its express soldering school! ), Autodesk, Ultimaker, Unidata, Microsoft, MathWorks (interestingly offering SW licenses that could run on Cortex SoC, like the new STM32F Nucleus boards). Roland and DWS that showed tons of milling machines, plotter and 3D Printers. I found very interesting some projects presented by Fonderie Digitali. Fonderie itself is a valuable experiment of a multidisciplinary lab, melting design, prototyping, research and development, technology put at fingertips of SMEs and Foundations for education and lean production purposes. They presented many projects, among those we saw Cluster Car, an open platform to put a car in the center of a smart connected concept: while driving you can communicate on web, share your data, read sms and emails. Another was Enabler, an IoT oriented Arduino-like board equipped with sensors and wireless connectivity. 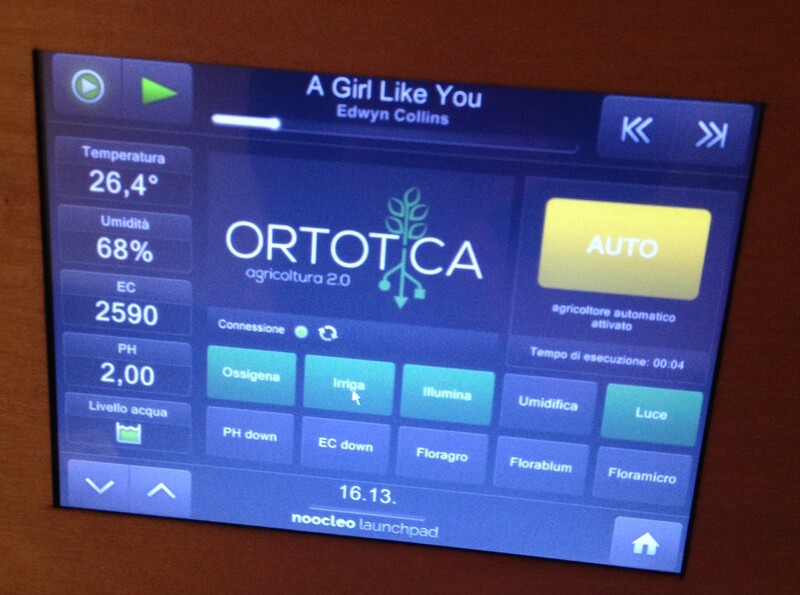 Much interesting, the Ortotica project: Domotics applied to agriculture at home. About alternate selling methods, we want to report about Etsy, the worlwide famous marketplace for artists, designer, creative people, obviously present between this area’s exhibitors. There were really too many makers, artisans, researchers, entrepreneurs to simply list all of them. I found myself 100% in agreement of the vision by arch. Scanu: the Maker Faire shouldn’t be a real Faire, since the exhibitors are not coming to sell their products or promote their catalog. It should be a true Exhibition instead, on which each booth, each stand must highlight and tell the story of the people that worked hard, had an inspiration and thus are influencing us: for these reasons, any exhibitor deserves 5 minutes of our time to get acquainted with! 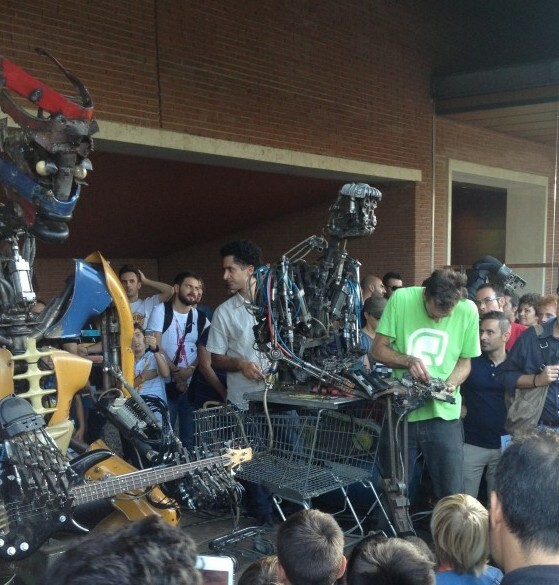 We hope that the next edition of Maker Faire Rome in 2015, will gather this suggestion. Before going through the best ideas we’ve seen, a last proud thought. It’s my fault for sure, but before this exhibition I knew very little about “IIT – Italian Institute for Technology“. What the guys from IIT have shown in the Faire impressed me deeply. The Foundation, established in 2003 by the Government, gathers more than 1’000 researchers and phD’s in various scientific sectors. 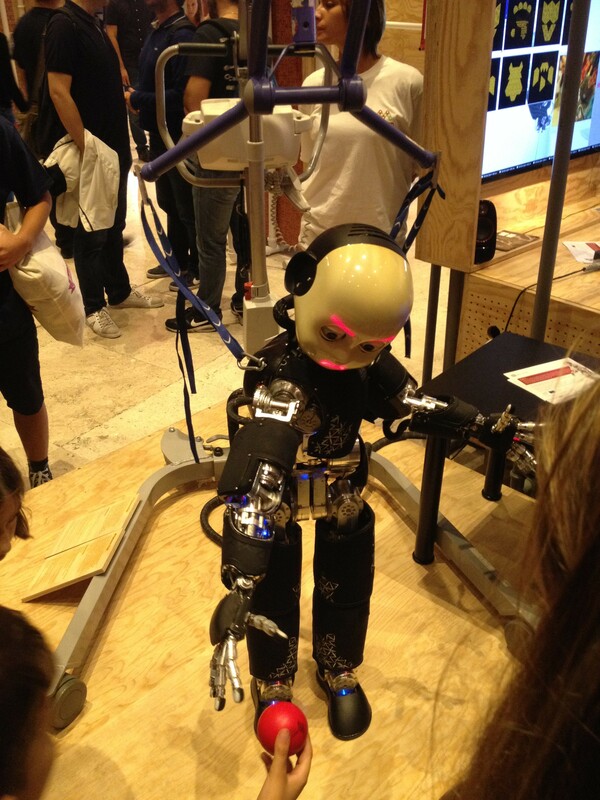 In the Maker Faire, they have shown iCub, an open source cognitive humanoid platform. The small kid-size robot was able to learn new objects, grab them and interact with human kids. The incredible thing was that kids were playing, touching and caressing the robot as if it was one of them. A boundary between human and robot interaction has been definitely crossed! Another impressive robot from IIT was HyQ. Do you remember Boston Dynamics DARPA financed robot? Well, here in Italy we are doing the same since 2010, for peaceful purposes, and the guys we’ve met at the Faire swear that their robot will rock all other competitors! HyQ is a Hydaulic-Electronic Quadruped developed at the Advanced Robotics Department of IIT. The robot weighs 80kg, is about 1 meter long and is constructed in aerospace-grade aluminum alloy and stainless steel. Each of its four legs has 3 joints that are actuated by hydraulic cylinders and motors. High-performance Fomula 1 valves are used to control each joint’s position and force. The force control in the legs enable a smooth interaction between the feet and the ground. Onboard cameras and laser range sensors create 3D maps of the surroundings. These maps are used by the robot control framework to plan its steps and avoid obstacles. Possible applications are disaster recovery (such as the clean-up of the Fukushima nuclear power plant), search and rescue, forestry technology and construction. And now, let’s go back to Makers and their inventive: here is our “best ideas list”, not sorted by ranking. Intoino, born in 2012 thanks to Kauffman Foundation Startup Weekend, is a starter kit for whom, not knowing deeply technology and electronics, wants to learn domotics and start making his ideas. 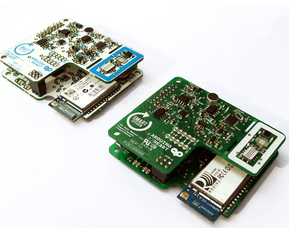 The kit contains the controlled board (Arduino: the name Intoino stands for INTuitive Open arduINO) and sensors, bluetooth BLE4.0 connected. The magic from Intuino is on two proprietary tools: the wifi dongle controller and the APP to program graphically (through a GUI) your own software. The wifi dongle, equipped with a powerful and fully programmable Cortex-M4 costs about 35€ (half of the Arduino wifi shield) and connects to the controller via USB: that means that you can remotize any Arduino board you want. Besides, you can assign some logic control or computation directly to the Cortex M4 chip in the dongle. The programming of controller and sensors is also awesome, since you just need to download the app and you have visual blocks that you can move and connect with your touch. You can download, import or create the code sketch you need and with a single click you can transfer the code, wireless, to your board. And you can also buy or sell your solution on Intoino marketplace. That’s it, around 99€! TarquinIoT is quite different, this board has been realized by Unidata thanks also to a public financing from local administration “Regione Lazio”. 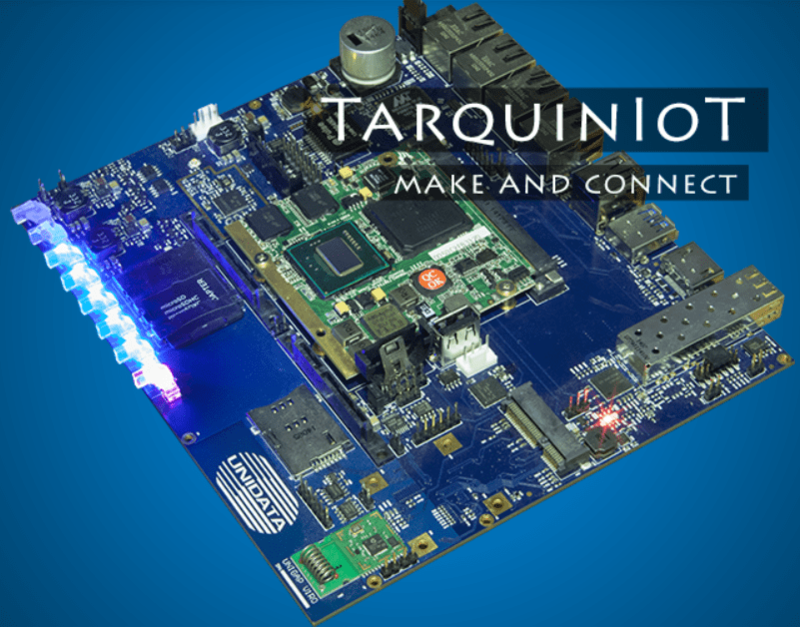 It is a very powerful and equipped IoT development board. With it you can control all the domotic devices at home or in a small office. Fiber Optic connector, HDMI, 3xUSB2.0 and 1xUSB3.0, 4xGBe switch, 2xSATA port, WiFi 802.11ac module onboard, GSM/UMTS/LTE module, PCIe expansion connector, compatibility with ZigBee, Z-Wave, EnOcean. Moreover, Unidata signed an agreement with CloudPlugs Inc. the North american leader of IoT platform software. For a price that will be less than 200€, you’ll get the board and the SmartPlug Agent licence. Can’t really wait to have it! Seeing the Maker Faire, the IoT especially applied to pollution, environmental monitoring, DIY home/office automation took a lot of exhibition space. Many groups presented their ideas on this subject: Thinking Things by giant telco company Telefonica, TukuTuku is a domotic remote control platform, TelecomItalia is working hard to its digital solutions. The trend here is put on SPARK.IO, an open source operating system, cloud connected, for IoT devices: will it become a new standard? Arduino with the special project “Smart Citizen Kit” belonging to “Arduino AtHeart” program caught my attention. It is a open source crowd-sourced project, based on Arduino controller and a specific shield capable of measuring temperature, pressure, humidity, CO2 and NO2 levels. Full battery or solar cell powered, with a nice minimalist design. The board is wifi connected to a worldwide community, allowing a distributed pollution measurement system. More boards from the same family will come in the very next future, for indoor pollution measurement, electromagnetic pollution, personal health, etc. Wunderbar by Conrad is similar to Intoino and the target is the same: wannabe makers or kids and school. 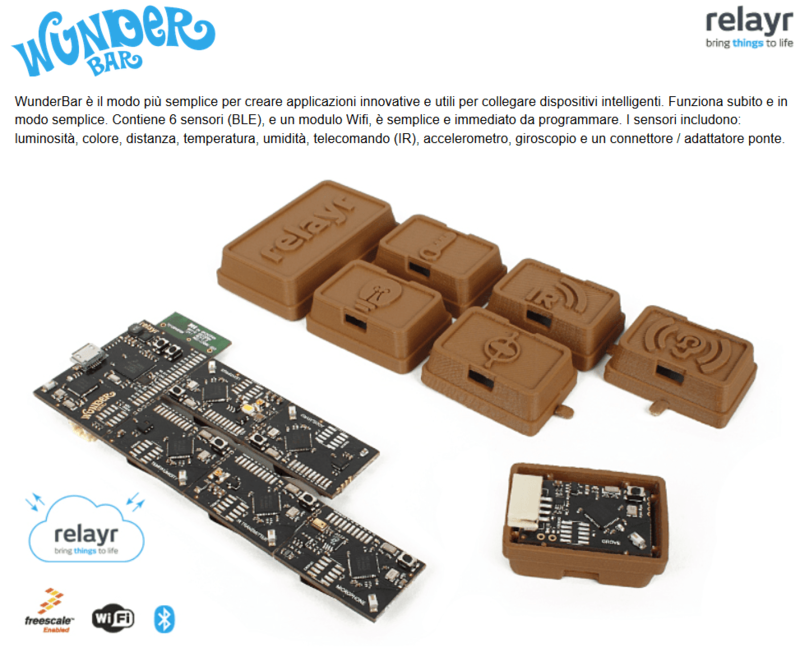 The chocolate-bar shaped controller and sensors communicates among them using BLE4.0, the controller is based on Cortex M4 architecture and you have right out of the box the wifi dongle and 6 sensors. The good thing here is that you can “snap” the chocolate tab and use it as a standalone unit (coin battery powered). The partnership with Relayr, cloud based platform for IoT helps you to share code sketch with the community, to remotize your solution and work on distributed projects, giving also a “standard” to your applications. One of the first applications seen on the Wunderbar/Conrad booth is Insulangel. By using the temperature sensor and a nice 3D Printed case, the founder of this startup (soon on kickstarter) created a temperature monitor for the insulin casebox that warns directly through the mobile phone push notify (using BLE) the diabetic person in case the temperature inside the case exceeds the 25°C. Noah Guitars has a charming story. Born in late ’90’s, they started creating a strato-like guitar with aluminum body. The interesting (and unplanned!!!) advantage using that metal for the guitar was that even with single coil pickups, the instrument is hum free. 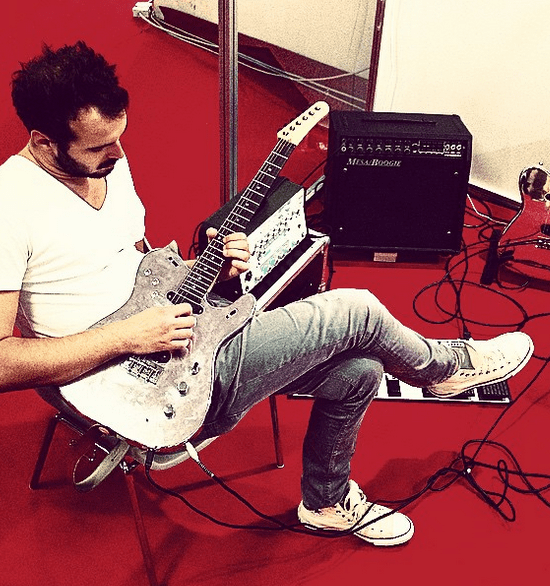 That conquered many famous guitar and bass players, from Ben Harper to Lou Reed, Saturnino and Muse’s bass player Chris Wolstenholme and others. At the Maker Faire Noah presented the DoublePlusG, an extended guitar equipped with accelerometers, Ir sensors, proximity sensors. By interacting with those sensors, the guitar player can enhance the effects and the behavior of the instrument, i.e. bending and vibrato simply shaking the guitar, modify the phase and the delay/reverb of the notes played moving the hand before the guitar body, everything without affecting the natural sound of the instrument (it is NOT a synth post processing the sound, like what other brands are doing with their extended guitars). 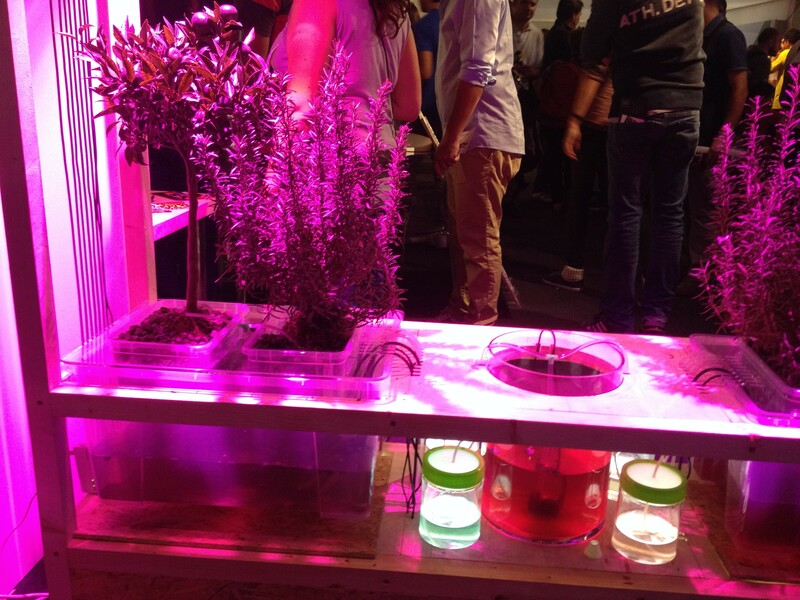 Those projects summarize the two sides of agriculture 2.0 seen on the Maker Faire. Biopic is a project, not available yet for purchasing, based on ten years deep studies on biological intensive agriculture by Renato Reggiani and his team. It is based on the IRRDUINO platform, an Arduino project dedicated to automatic control of domotic irrigation systems. 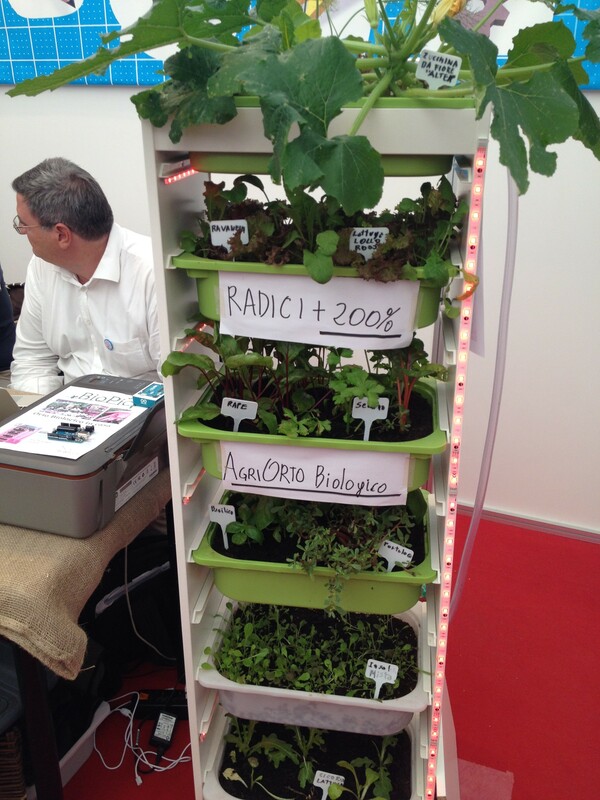 The prototype shown is a vertical vegetable garden, with PH and humidity controlled by the IrrDuino board and the growth of vegetables is pushed up by natural light leds, again controlled by the MCU. The real advantage of this system is not only the “hardware” but also the selection of vegetables that are more stimulated (thanks to the pigments present in their leaves) by the LED used and, above all, by choosing specimens that don’t compete but cooperate among them, optimizing the production (without chemicals!). According to the creator of this idea, a simple garden like the one shown below can feed a family of 2-3 people with low effort. The shortcoming? That their idea has been quickly praised and financed in Rotterdam, thanks to EU Erasmus for young entrepreneurs program. Another case of brain drain, ouch! 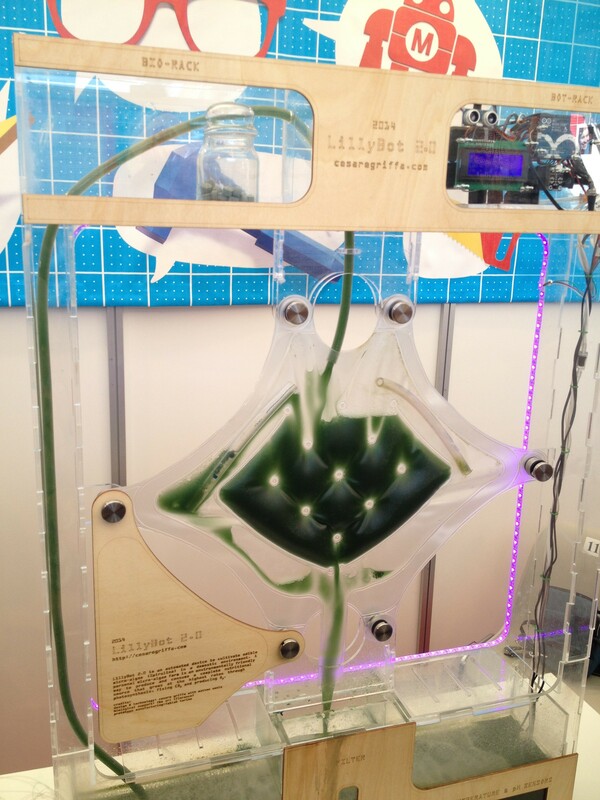 WaterLilly/Lillybot2.0 is the other side of the moon; it is an intensive hydroponic system, controlled by Arduino and few custom made wiring and sensors, to grow Spirulina cyanobacteria. The controller checks the PH, O2 and temperature level continuously, switches on or off the led to stimulate the photosynthesis and monitors when it’s harvest time. The plastic bag you can see in the picture is a proprietary designed “lung” that mixes continuously the liquid solution with fresh air (O2), granting the best conditions for the bacteria. Spirulina can be eaten as dietary supplement, being 60% rich in proteins and aminoacids or it can be used in biomass reactors to have natural gas and then electrical power and heath. The project, shown by architect Cesare Griffa, is to equip buildings facades with a giant lillybot system, to turn our cities into sustainable gardens. Hope to see the first installation soon! 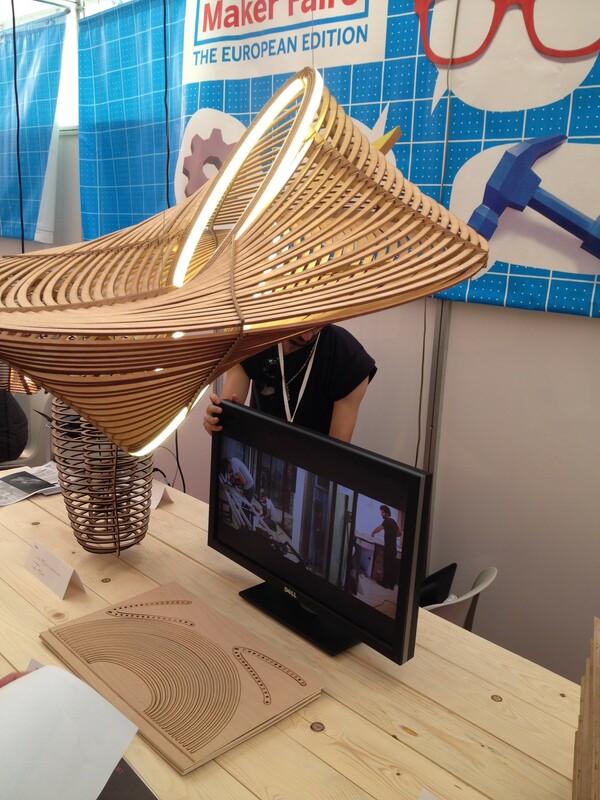 Ok it’s not an open source electronic project, but we liked this lamps last year and it has been a happy surprise to see again Mauro Del Santo with his Unsolid surfaces here. Behind his work we find two very interesting aspects: the first is the use of a patented flexible wood (Bendywood) that you can literally bend with fingers, and the second is the surface design using complex mathematical equations. 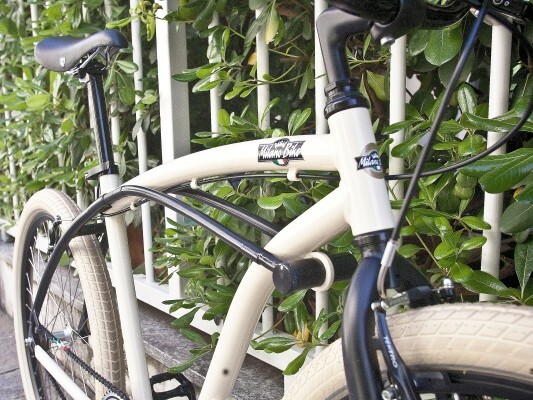 Mauro is IED’s professor and he is approaching to design in a very structured way. He starts from mathematical description of complex solids and then de-structures them, moving from “solid” to “unsolid” shape. After the design has been done, the parts blueprint is sent to a laser cutter that cuts all the flexible wooden parts. Then, as you can see on Unsolid website, it’s all “maker job”. That’s all folks, hope that we could have given you an out-of-the-stream overview of this awesome event. 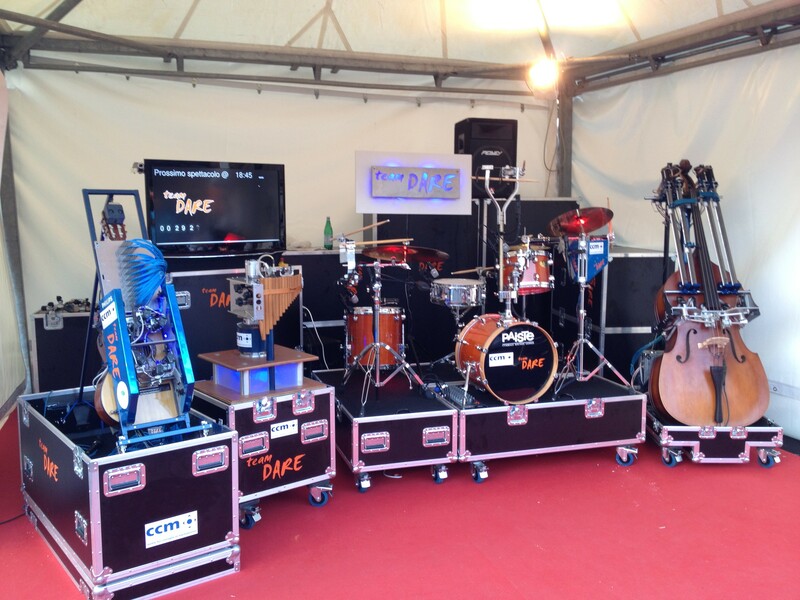 See you soon on the next Maker Faire European edition in Rome! Disclaimer: all the opinions expressed in the post are just personal opinions of the writer. All brands and products, trademarks mentioned above are property of respective companies. Maker Faire Roma 2018: Today is the Day!